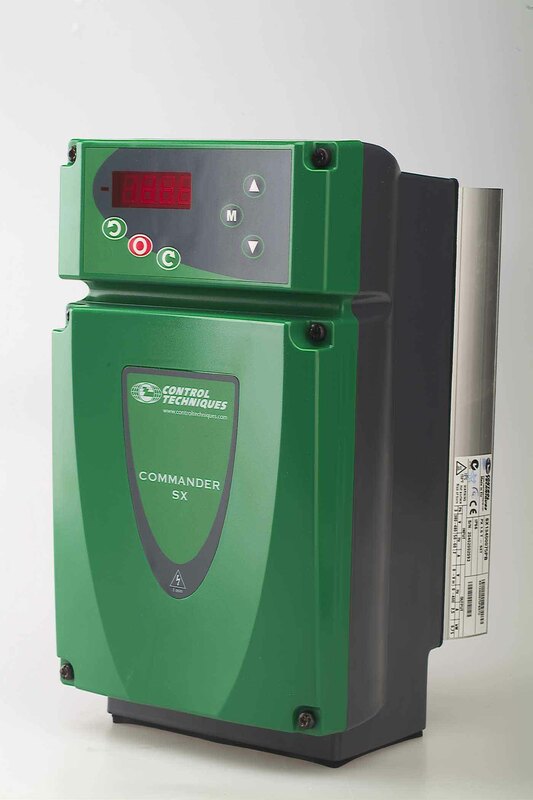 From 0.37 to 7.5 kW (0.5 to 10hp) the Commander SX AC Drive has been designed as a robust, IP66, NEMA 4X wall mounting AC drive for applications in food, drink, paper, textile and packaging machines where dirt, dust and other pollutants need to be regularly washed away. IP66, NEMA 4X enclosed drive - no need for separate cabinet. avoiding cabling, cabinet and installation costs. More than 10 common preset drive applications. 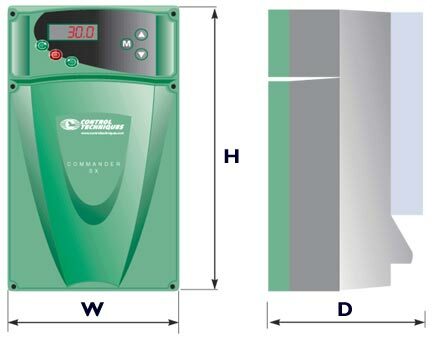 4 kW (5hp) - IP66 EMC filters, from 5.5 kW (7.5hp) as option. For tough, wet and dusty environments. 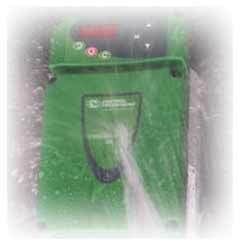 Designed for factory wash-down with pressure hose, and detergents. Wall or machine mounting - no extra cabinets required. - no drive installation specialists required. IP66 NEMA 4X rating, for mounting in close proximity to the motor and application. Ambient temperature 40 ºC (104ºF) without derating. 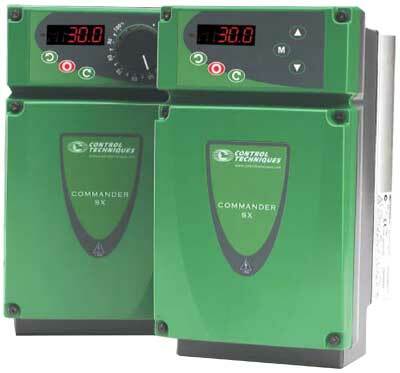 Up to 50 ºC operation with a maximum derating of only one motor size. Removable gland plate for easy termination and removal of control and motor cables. 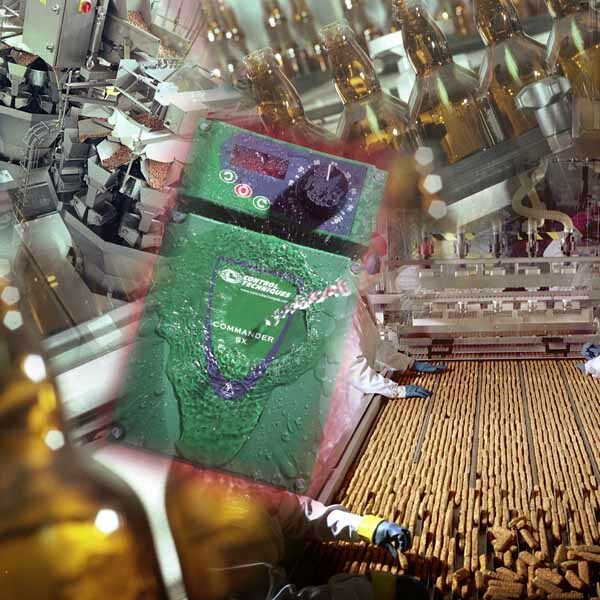 Complies with EN954-1 Cat 3 with PX-Secure option. EMC cable gland option for shielded cable management. Electromagnetic Immunity complies with EN61800-3 (Drive standard) and EN61000-6-2 (generic standard). Electromagnetic Emissions complies with EN61800-3 (Drive standard - 1st and 2nd environment) with integral EMC filter. Complies with EN61000-6-3 and EN61000-6-4 (Generic standard) with integral EMC filter. - Anodized Aluminium heat sink. - All slopes > 3 degrees incline. - Roughness < 0.8 microns. - No zones where liquids can accumulate. Closed loop vector with PX-Encoder option. Speed reference input 0-10 V, 0-20 mA, 4-20 mA. 5 digital inputs. Enable, Run forward, Run reverse, Jog, local / remote select. Switching frequency 3-11 kHz with 4 .5kHz as default. Acceleration and Deceleration ramps (linear and S-type). Serial communication as standard - Modbus RTU RS485 via RJ45 connector. DC injection braking as standard. Integral dynamic braking transistor and resistor. Note: The PT and DV versions require PX-LCD or SXSoft to commission the drive.